Dr. Schilt and his team at McKenzie River Dental provides dentures in Springfield which can replace missing teeth and be utilized depending on your personal needs. McKenzie River Dental is a comprehensive dental practice with an on site lab, which means that your dentures can be completed in one day. Dentures – A full denture is a removable device that replaces all of the teeth in an arch. It is not attached to anything, and as a result, they are often loose, move while eating and speaking, and rely on adhesives to keep them in place. 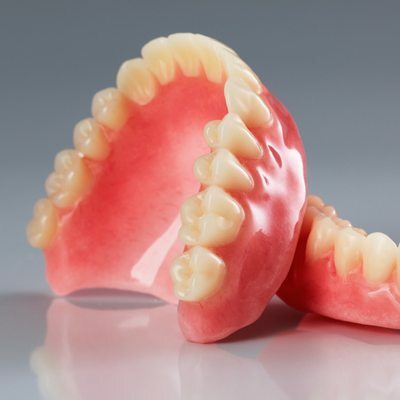 Overdentures – Giving dentures more stability and better fit, an overdenture is a type of denture that is placed over dental implants, or retained roots, and typically “snaps” onto place over the anchors. The amount of bone shrinks after teeth extraction. Natural roots and dental implants will keep this from happening, but without teeth, the bone continues to diminish throughout life. Dentures will need to be replaced or realigned periodically in order to compensate for this loss. Regular dental examinations at McKenzie River Dental are essential for the denture wearer so that the oral tissues can be checked for any changes or need for a reline.